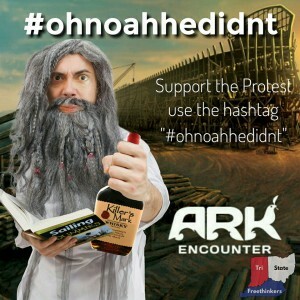 Ark Encounter Protest Contained the Predictably Unexpected » « CONTEST!! Picket Sign Writer’s Block… I Need Your Help! As I wait out flight delays in my local airport (apparently airplanes can’t fly after all of their brake fluid dumps out onto the tarmac), I’m getting pretty pumped for this event! After the protest, we’ll be hanging out on the University of Cincinnati campus for the Rally for Science and Reason, where I’ll be speaking along with the names I already mentioned. I’ll do my best to post updates as they happen there. Stay tuned! I hope to see you there, standing up for education and critical thinking, and against ignorance and deceit.